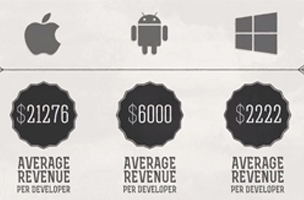 Video Infographic: How Much Money Do Mobile Apps Make? It’s hard to predict viral success like that of the Flappy Bird game app, and given the large number of app possibilities, it’s just as easy to lose money making apps. Even for Flappy Bird, success did not come immediately and it required some marketing ingenuity. The game only took one day to make, but months to actually find its viral success something other developers may never see. Of course, there’s still a chance to make revenue off of ads, and this is where this infographic comes in. This video breaks down the average download numbers, the amount of revenue each download will generate, and how much money each developer will be paid according to each app’s OS. Not surprisingly, Apple’s iOS dominates the revenue.